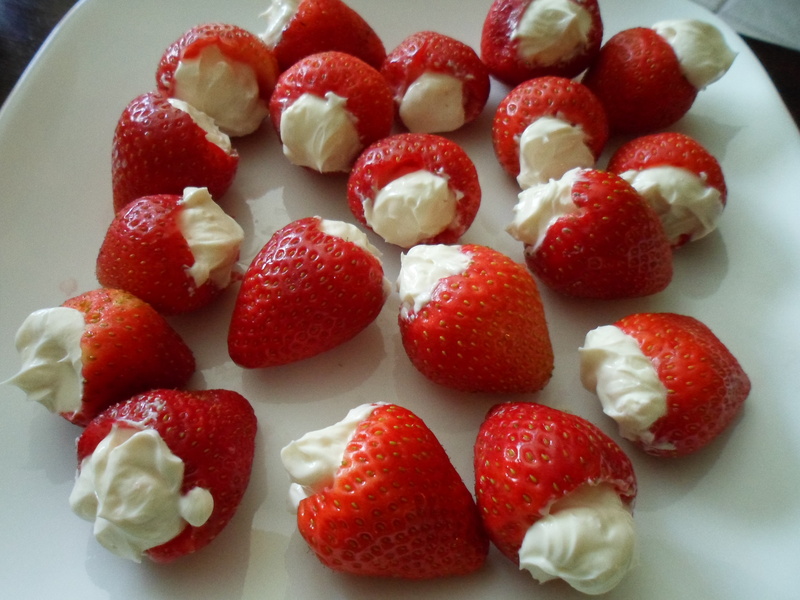 For Memorial Day I wanted to make a quick, easy and healthy bite size dessert. I found a lot of recipes for stawberries filled with a cheesecake type filling that looked delicious, but had entirely too much saturated fat, calories and sugar for my liking. 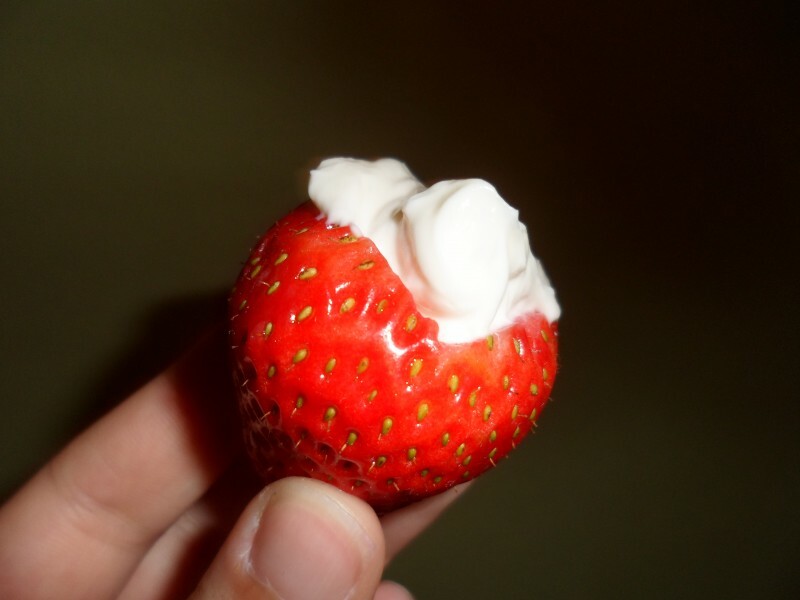 But I loved the idea of filling a strawberry to make a bite sized treat. Strawberries are full of fiber, vitamin C, and multiple other vitamins, minerals and antioxidants. Research shows that eating strawberries may decrease cancer risk, improve cardiovascular health and boost cognitive functioning so you can definitely feel good about eating these tasty treats! For my filling I decided to use neufchatel cheese (like cream cheese but with 1/3 less fat), nonfat plain greek yogurt to cut the fat and calorie content further, a small amount of sugar (1 teaspoon) and pure vanilla extract. Everyone seemed to enjoy them and they were so simple and easy to make. 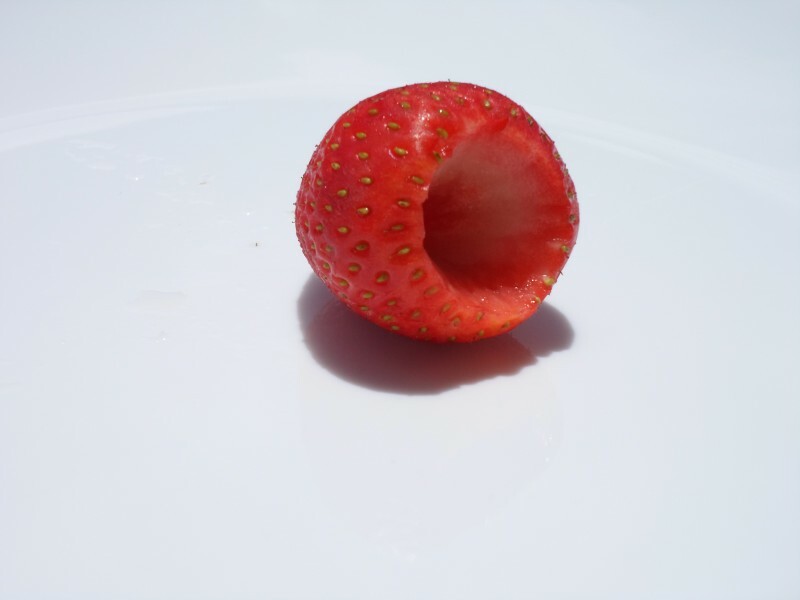 Clean the strawberries and remove the center of each strawberry with a small paring knife to make a hole for the filling. See picture below. Combine remaining ingredients (cheese, yogurt, sugar and vanilla extract) together in a bowl and mix well. Once well blended, scoop filling into each berry with a small spoon. If you want it to look more professional and fancy you can try using a cake decorator or icing bag. (I just scooped the filling in with a spoon because I was in a rush…. that is why mine look a little messy) Refrigerate until ready to serve. Super easy! The Dannon Oikos Greek Nonfat Plain Yogurt (5.3oz container) has 80 Calories, 15g Protein, 6g Carbohydrates, 0g Fat and 15% of your daily Calcium needs. The Fage Nonfat Plain Greek Yogurt (6ozs) contains 100 Calories, 18g Protein, 7g Carbohydrates, 0g Fat, and 20% of your daily Calcium needs. The Chobani Plain Nonfat Greek Yogurt (5.3oz) has 90 Calories, 15g Protein, 7g Carbohydrates, 0g Fat, and 15% of your daily Calcium needs. 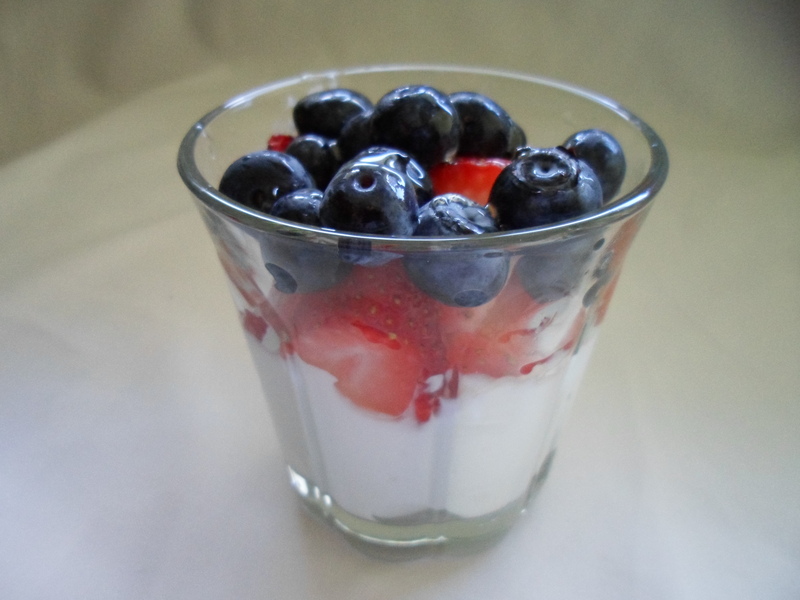 Scoop yogurt in a bowl or parfait glass. Top yogurt with blueberries, strawberries and honey. Enjoy! 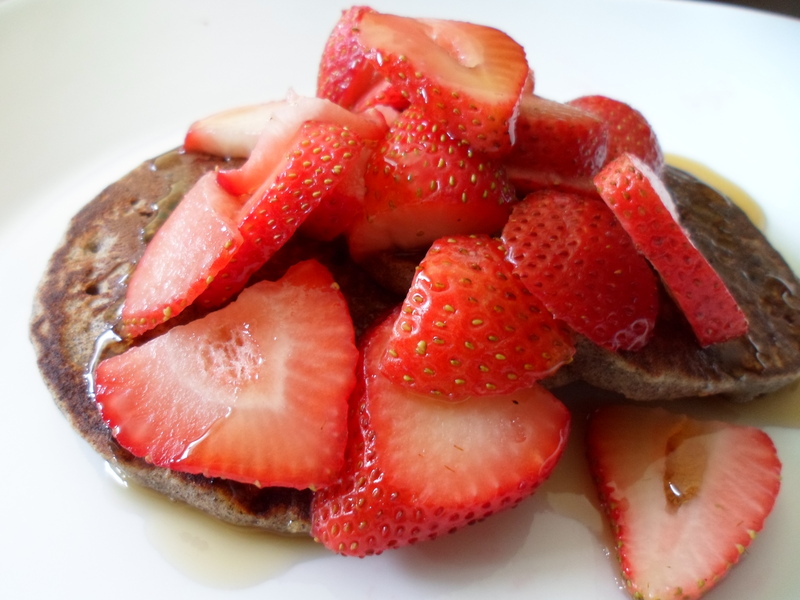 I have tried making buckwheat pancakes a few times but couldn’t get them to taste exactly how I wanted until today 🙂 I used a recipe I found from Cookie and Kate (http://cookieandkate.com/2013/buckwheat-pancakes/) for guidance and made a few adjustments until they tasted exactly how I wanted. Buckwheat flour actually is not wheat and is gluten free so those with celiac disease or a gluten sensitivity can consume buckwheat safely. It is a whole grain so it contributes more fiber and vitamins than regular all purpose flour. I did not use sugar in this recipe, which is normally added to most pancake recipes. I used no sugar added applesauce (fruit contains natural sugar along with vitamins and many healthy plant compounds) which I thought made the pancakes more moist and cake like. Enjoy! Mix dry ingredients (flour, baking powder, salt, cinnamon) in a large mixing bowl. Whisk egg in a smaller bowl and mix in wet ingredients (vanilla, milk, applesauce) with whisked egg. Add egg mixture to the dry ingredients in the large mixing bowl and mix until thoroughly blended. Spray large skillet pan or griddle with nonstick spray and preheat to medium heat. Pour batter in pan to form 4 inch pancakes. Flip over after about 1-2 minutes, when small bubbles appear. Cook the other side for another 1-2 minutes until golden brown. Put on a plate and top with fresh fruit. Drizzle lightly with pure maple syrup if desired.